Punishing the children of illegal immigrants: There’s something wrong with this picture. NOTE: There is a lot of discussion occuring at the ULW Facebook page – search for "Utah Legislature Watch". A prospective college student wishes to enroll at the University of Utah but lives in Wyoming. To avoid paying out of state tuition, this student moves to Utah and obtains employment and after residing and working for a period of one year establishes residency. This student is now eligible to enroll at the U of U at in-state tuition costs. This is just one way of establishing residency. The entire Utah Code on residency requirements can be found at Title 53B State System Of Higher Education, Chapter 8 Tuition Waiver and Scholarships, Section 102 Definition of resident student. 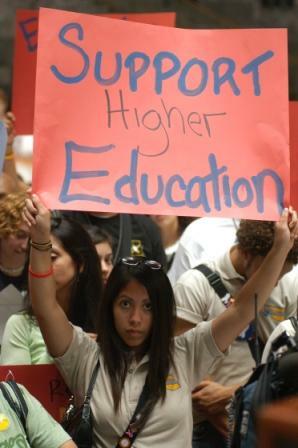 A student who has lived in Utah most of her life, has attended high school and has graduated with a high school diploma and who happens to be the child of an illegal immigrant is eligible for in-state tuition at the U of U (and other higher ed institutions)……..for now. If Rep. Carl Wimmer, R-Herriman has his way, with a bill he plans to introduce in the 2011 Utah Legislative session, children of illegal immigrants in Utah will have to pay out of state tuition. (In-state tuition costs at the U of U run about$2600 per semester compared to Out-of-state tution at about $8300). Wimmer’s bill doesn’t propose blocking access to education for students based on citizenship status. Wimmer said the tuition break is unfair to American-born citizens. Wimmer goes on to say that he feels his bill will be successful in light of the failure of Congress to pass the DREAM act, which would have permitted children of illegal immigrants to earn permanent status through education or military service. This is a bad bill. It punishes children. Rep. Wimmer should devote his energies to bills that are not punitive in nature. Posted on December 27, 2010 by dltPosted in UncategorizedTagged higher education, immigration issues, utah. Previous Previous post: Taking a deep breath and starting again.